On the above chart which is based on monthly sales data from Sandicor and SDAR, we see that median sale prices on attached homes (condos) and detached single family homes in San Diego County kept increasing flat throught the year. Before that, overall median sales prices had remained flat since the mid of 2009 with a few spikes here and there. After seeing the median home sales price falling on a monthly basis for 2 years since 2007, being flat for the next 3 and now a modest increase through July of 2012, does that mean that home prices in San Diego are about to rise? All indicators, combined with historic low interst rates point to that. 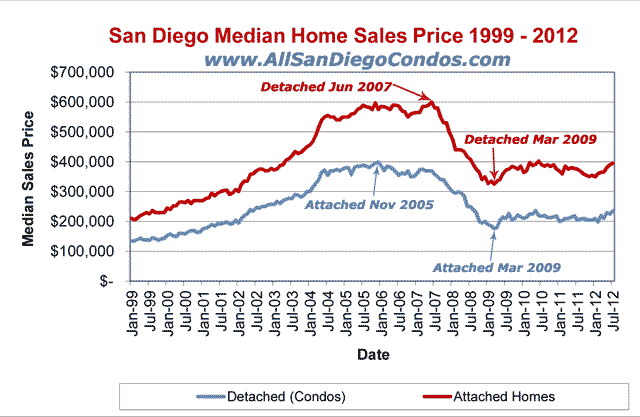 On the above chart which is based on monthly sales data from Sandicor and SDAR, we see that median sale prices on attached homes (condos) and detached single family homes in San Diego County remained flat throught the year. as a matter of fact median sales prices have remained flat since the mid of 2009 with a few spikes here and there. After seeing the median home sales price falling on a monthly basis for 2 years since 2007 and now being flat for the next 2, does that mean that home prices in San Diego are about to rise? All indicators, combined with historic low interst rates point to that.